Chinese Life Scientists Society in the UK (CLSS-UK) was founded in 1992 and since then it has been devoted to building a link for Chinese life scientists in the UK and in China. CLSS-UK is the only organisation of its kind in the UK, representing all Chinese scientists in the broadest fields of life and biomedical sciences from mainland China and beyond. It also has become one of the most important professional organisations within Chinese community. So far, CLSS-UK has over 5000 members, comprising the best academics, scientists, clinicians and students from all over the UK, as well as alumni who have return back to China or are currently working in other countries. On April 6, 2008, the same day as the auspicious snow welcomed the Olympic torch relay in London, the Academy of Life Sciences for Chinese in the UK (ALSC-UK) was officially announced in the Education Section of the Chinese Embassy in London. ALSC-UK is the senior members’ club of CLSS-UK and is the brainchild of Minister Counsellor Mr Yongda WANG of the Education Section of the Chinese Embassy. At the inauguration meeting, Professor Mingqing DU from the University of Cambridge introduced the principles of this new initiative and the meeting agenda. Dr. Wei Wang from De Montfort University described the preparing processes of the meeting and the ALSC-UK. Dr. Henglong HU from GlaxoSmithKline presided over discussions on the Chinese and English names of the Academy and the titles of its members in both Chinese and English, as well as the organisational structure and key appointments of the Academy. Professor Xin LU from the University of Oxford led a warm discussion on the unique opportunities, rights and responsibilities of the members of the ALSC-UK. Finally, Dr. Qihe XU, Chairman of CLSS-UK (2007-2009), concluded the meeting by summarising the agreements reached during the meeting and especially emphasised the expected role for ALSC-UK in promoting China-UK scientific and technological collaboration. The meeting confirmed the appointment of Professor Mingqing Du as the President of ALSC-UK, with Professor Xin LU, Professor Qingbo XU, Professor Zhanfeng CUI, Professor Wen WANG, Dr. Henglong HU, Dr. Wei WANG, and Dr. Qihe XU as Vice-Presidents. Dr. Qihe XU was appointed Chairman of the nomination committee of ALSC-UK, which is in charge of identification and nomination of fellow candidates. Professor Mingqing DU was appointed the Chairman of the Selection Committee of ALSC-UK, which makes final decisions on award of fellowships and other important issues. Prof Ziheng YANG, FRS from University College London, as well as Minister Counsellors Mr Yongda WANG and Mr Xiaogang TIAN of the Education Section of the Chinese Embassy also attended the meeting and delivered warm congratulating speeches. From the left in the front row: Professor Xin Lu, Mrs and Mr Minister Counsellor Yongda Wang, Minister Counsellor Xiaogang Tian,Professor Ziheng Yang FRS, Professor Mingqing Du; from the left in the second row: Dr. Honggang Zhou, Dr. Xuebin Dong, Dr. Qihe Xu, Dr. Henglong Hu, Dr. Wei Wang, Dr. Shiyu Yang, Dr. Zhidao Xia and Dr. Xin Fang. 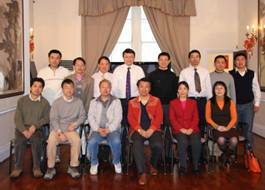 At the April 6, 2008 Meeting in London, Professor Mingqing DU, University of Cambridge, was appointted Founding President of the ALSC-UK. After wide selection and stringent evaluation by the Nomination Committee and Decision Committee, 23 ALSC-UK Founding Fellows were elected on 13th September 2008 at the 14th Annual Meeting of the CLSS-UK in Oxford. A majority of the elected ALSC-UK Fellows attended the CLSS-UK Annual Meeting where the ACLS-UK Fellows’ Meeting was held. On behalf of the CLSS-UK, Dr. Qihe XU, Chairman of CLSS-UK (2007-2009) warmly congratulated Fellows for their successful election. Drs Shiyu YANG, Hongwei ZhANG and Xin FANG, Vice Chairmen of the CLSS-UK, attended the meeting as observers. Left: Some Founding Fellows who attended the 14th Annual Meeting of CLSS-UK in Oxford. Right: Group photo of Fellows and some CLSS-UK members at the Oxford Meeting. At the 15th Annual Meeting of CLSS-UK held on 12th-13th September 2009 in London, Professor Qingbo XU was elected new President of ALSC-UK. Additional 8 senior members of CLSS-UK were elected as Fellows of ALSC-UK. They are Professor Kian Fan CHUNG from Imperial College London, Professor Ian WONG from School of Pharmacy, University of London, Professor Ping WANG from Queen Mary College, University of London, Professor Swee Lay THEIN, Dr. Wuding ZHOU and Ying Sun from King's College London, Dr. Suling LI from Brunel University and Dr Zhiliang LU from MRC Human Reproductive Sciences Unit, Edinburgh. Some Founding Fellows and new Fellows who attended the 15th Annual Meeting of CLSS-UK in London. Group photo of Fellows, external experts and some CLSS-UK members at the London Meeting. ALSC-UK is the senior members’ club of CLSS-UK and currently has 31 elected Fellows. It receives full support from CLSS-UK and also has responsibility to support academic activities organised by CLSS-UK. President of ALSC-UK is elected from ALSC-UK Fellows. To enforce the intimate link between ALSC-UK and CLSS-UK, Prof Qingbo XU, President of ALSC-UK is automatically Honorary Chairman of the CLSS-UK Committee; Dr. Xiongzhong RUAN, Chairman of the CLSS-UK Committee is automatically Standing Vice President of ALSC-UK (appointed by President of ALSC-UK). Other Vice Presidents will be elected from ALSC-UK Fellows. In addition, ALSC-UK President has the right to appoint Executive Vice Presidents and President Assistants to assist his work. ALSC-UK Fellow candidates are nominated through the ALSC-UK Nomination Committee chaired by Dr Xiongzhong RUAN (Standing Vice President of ALSC-UK) and the final decision-maker is the ALSC-UK Decision Committee chaired by Prof Qingbo XU (President of ALSC-UK). The election outcome will be announced at the next CLSS-UK Annual Meeting.